Dr. Anderson holds a Bachelor of Aeronautical Engineering Degree from the University of Florida. He attended the Ohio State University under the National Science Foundation and NASA Fellowships, graduating with a Ph.D in Aeronautical and Astronautical Engineering. From 1959 to 1962, he was a Lieutenant and Task Scientist at the Aerospace Research Laboratory at Wright-Patterson Air Force Base. In 1966, he joined the U. S. Naval Ordnance Laboratory as Chief of the Hypersonic Group. In 1973, he became Chairman of the Department of Aerospace Engineering at the University of Maryland, and since 1980 has been a professor of Aerospace Engineering at the university. In 1982, he was designated a Distinguished Scholar/Teacher by the university. During 1986-87, while on sabbatical from the university, Dr. Anderson occupied the Charles Lindbergh chair at the National Air and Space Museum of the Smithsonian Institution. He continued with the Air and Space Museum as their Special Assistant for Aerodynamics, doing research and writing a book on the history of aerodynamics. In addition to his position as professor of aerospace engineering, in 1993 he was made a full faculty member of the Committee for the History and Philosophy of Science and in 1996 an affiliate member of the History Department at the University of Maryland. In 1996 he became the Glenn L. Martin Distinguished Professor for Education in Aerospace Engineering. In 1999 he retired from the University of Maryland and was appointed Professor Emeritus. Dr. Anderson has published ten books and is the author of over 120 papers in radiative gasdynamics, re-entry aerothermodynamics, gasdynamic and chemical lasers, computational fluid dynamics, applied aerodynamics, hypersonic flow, and the history of aeronautics. In terms of the publishing world, in 1987 McGraw-Hill chose Dr. Anderson to be the senior consulting editor on the McGraw-Hill Series in Aeronautical and Astronautical Engineering. Dr. Anderson is in Who’s Who in America. He is a member of the National Academy of Engineering, an Honorary Fellow of the American Institute of Aeronautics and Astronautics (AIAA), and a Fellow of the Royal Aeronautical Society. London. He is also a Fellow of the Washington Academy of Sciences, and a member of Tau Beta Pi, Sigma Tau, Phi Kappa Phi, Phi Eta Sigma, the American Society for Engineering Education, the History of Science Society, and the Society for the History of Technology. In 1988, he was elected as Vice President of the AIAA for Education. In 1989, he was awarded the John Leland Atwood Award jointly by the American Society for Engineering Education and the American Institute of Aeronautics and Astronautics “for the lasting influence of his recent contributions to aerospace engineering education.” In 1995, he was awarded the AIAA Pendray Aerospace Literature Award “for writing undergraduate and graduate textbooks in aerospace engineering which have received worldwide acclaim for their readability and clarity of presentation, including historical content.” In 1996, he was elected Vice President of the AIAA for Publications. He has recently been honored by the AIAA with its 2000 von Karman Lectureship in Astronautics, and with its History Book Award for 2002 for a History of Aerodynamics. 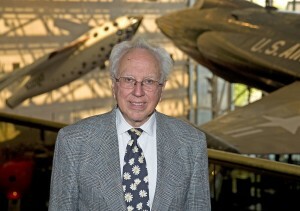 In 2002, he was awarded the position of Honorary Fellow of the AIAA, the Institute’s highest award. Dr. Anderson is active and known for his professional and educational activities both nationally and internationally. He has given over 40 short courses to the major aerospace companies, the Air Force Academy, the government, and in Europe at Rolls-Royce in England, and the von Karman Institute in Belgium. This includes a pioneering hypersonic aerodynamic course jointly sponsored by the AIAA and the University of Maryland. Dr. Anderson is a native of Lancaster, Pennsylvania.